Perennial herb with compound bulbs flowering stem 25 cm - 1 m tall Leaves: six to twelve, mainly growing from lower half, 20 cm - 1 m long, 0.5 - 1.5 cm wide, flat, keeled on the back, withering from the tip by flowering time. Inflorescence: an upright, rounded, compact umbel of zero to twenty flowers raised on a single stalk and subtended by a large, beaked, persistent bract. Flowers growing with stalkless, egg-shaped bulblets. Flowers: on stalks three to ten times as long, greenish white to pink, 3 - 5 mm long, more or less bell-shaped, with six tepals. Stamens six. Fruit: a short, three-lobed capsule. Produces few or no seeds, generally reproducing by way of its bulbels (cloves). Bulbs: comprised of five to fifteen or more bulbels (cloves), up to 6 cm tall and 8 cm wide, and encased in a white to light brown papery coating. 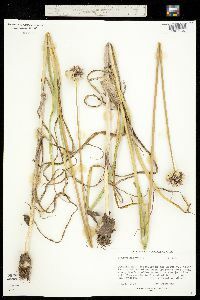 Similar species: Similar Allium species have leaves which grow at the base of the plant, whereas those of A. sativum extend to about halfway up the stem. 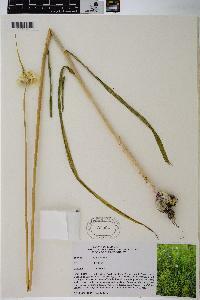 Habitat and ecology: Introduced from the Old World, possibly derived from the Asian Allium longicuspis. An occasional escape from cultivation. Has been found in old fields, along railroads, and in waste ground near cattle yards. Etymology: Allium comes from the Latin word for garlic. Sativum means cultivated. Well established on a rocky, wooded slope in McCormick Creek State Park, Owen County. Hansen (Proc. Ind. Acad. Sci. 37: 319. 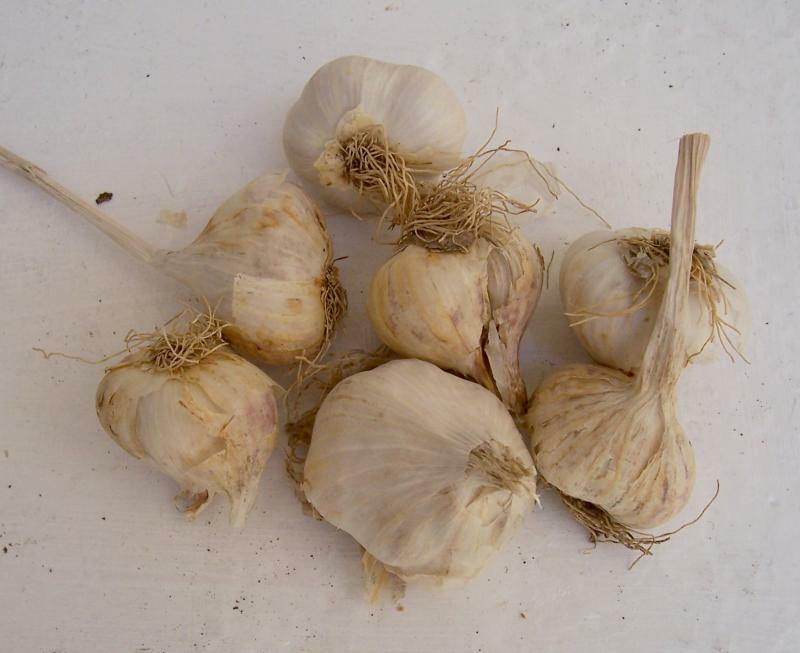 1928) writes that a number of farms, gardens, and a cemetery in Jefferson County are infested with the escaped form of the cultivated garlic (Ailium sativum L.). It is almost certain that if a species of Allium becomes established it will persist unless it is destroyed by man. Bulbs usually compound; stem 3-8 dm, leafy to or beyond the middle; lf-blades flat, keeled on the back, 6-12 mm wide; umbel erect, producing ovoid bulblets and a few fls, the invol deciduous in one piece, terminating in a beak 3-10 cm; 2n=16. Native of w. Asia, rarely escaped from cult. in our range.